Working locum tenens can be a great alternative to the “typical” physician’s career, but like any contract-based career, how great it is really depends on the quality of the jobs you take. Locum physicians work through recruiting agencies, so obviously a big part of finding the right locum tenens positions is finding the right agency, but there are other factors to keep in mind as well. Many locum physicians look to take contracts in new and different locations, which can be an incredible experience for a medical professional. You get to experience different cultures, work in new facilities, and practice where you’re really needed. Contracts can also lead you to beautiful, but difficult regions. Your recruiter should help you prepare for any new contract, but be sure to research the areas where you’re considering taking locum contracts—particularly if you’re trying for something a little more adventurous. Location makes a difference in every job, and evaluating where you really want to be is part of finding the perfect position. One of the greatest resources you have as a locum physician is the wide network of other locum tenens physicians out there in the world who are eager to share their experiences. The current state of the healthcare system has led to an environment where locum positions are increasingly more common. From industry blogs to Reddit threads, the internet is full of doctors just like you who may be able to give you background on a facility or region before you begin a new contract. Your recruiter can also be a huge resource in checking out a facility before you decide if a contract is right for you. When choosing between locum tenens jobs, salary can be the determining factor for many physicians, but you want to be aware of the differences in average cost of living in the area of the contract when you weigh your options. As we mentioned before, locum tenens positions often take you to where your help is needed most, which may not be a metropolitan hospital with a huge budget. 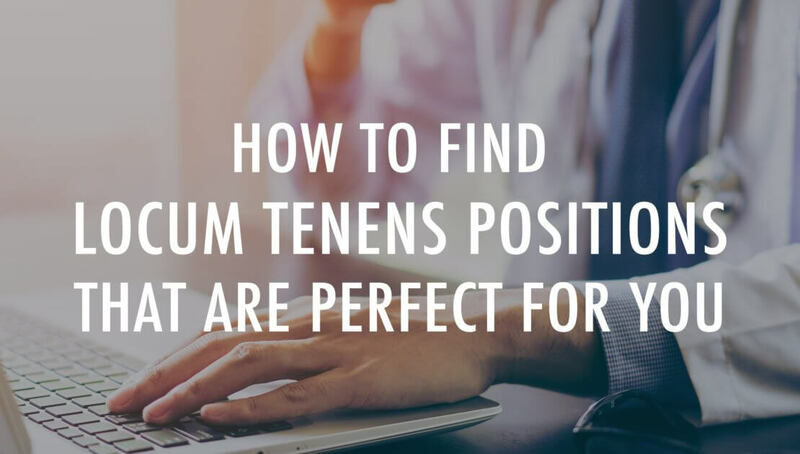 Working locum tenens can give you new levels of flexibility to choose the positions that are perfect for you at a given time, so make sure you’re applying to the right ones.